For a good laugh, check out this list of nasty things to do while playing Settlers. Definitely gonna try #2 if I ever get dragged into playing the game again. 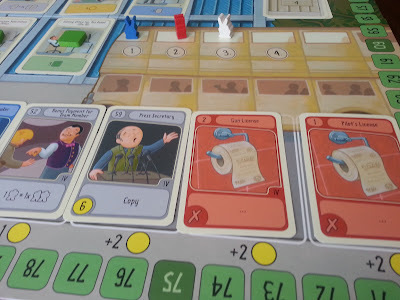 The hobby gaming obsession has exploded so much so over the past decade that many games have come out with themes and mechanics that reflect humourously on hobby gaming itself. And there's so many of us suckers now that these games are even finding a market - The Boardgamegeek Game and Cleopatra's Caboose are prime examples. 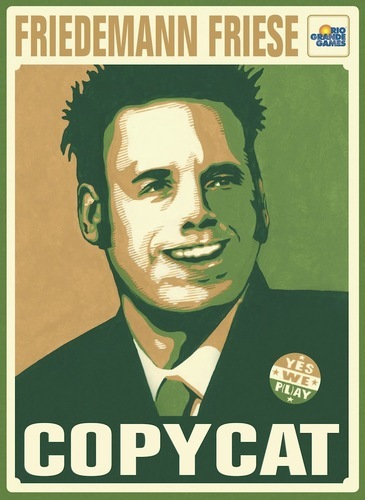 Copycat, by the brilliant and weird Friedemann Friese of Power Grid and Black Friday fame, is another prime example of this. 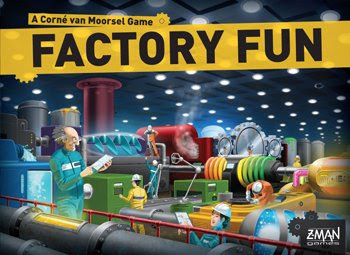 Friese decided he wanted to steal mechanics from the top-rated games on BGG and put 'em together to create something new. Of course, this is a not-so-subtle commentary on the endless variations of modern game mechanics that we're seeing over and over - worker placement, deck-building, you name it. 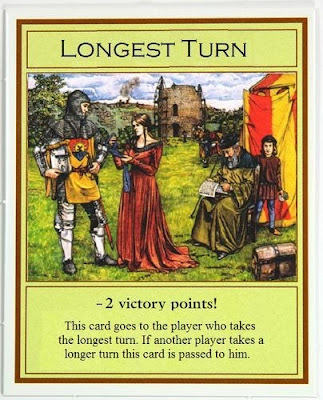 So Copycat steals the worker-placement/action card reveal from Agricola, the deck-building and coins for buying from Dominion, increasing values of unused actions from Puerto Rico, and the sliding card row from Through the Ages as well as tossing a few more clever ideas into the mix. And I daresay that my first play of this was rather magnificent! 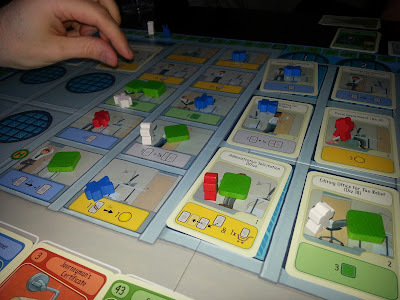 Once the fog had lifted from trying to parse yet another confusing Friese and Rio Grande ruleset, we really started to get into the game. Not knowing what I was doing and not knowing that money would be really hard to come by later, I tried my classic "Chapel" strategy from Dominion of burning down my deck and then building it back up. Unfortunately I used more actions burning my deck then building it and so had to play catch up in the end game. But man was this fun. Long-term strategy from the deck-building and deep challenging tactical play every round from the action spaces and the cards on hand. And a devious decision every round for turn order - which card to give up from a hand of only 5? Delicious. 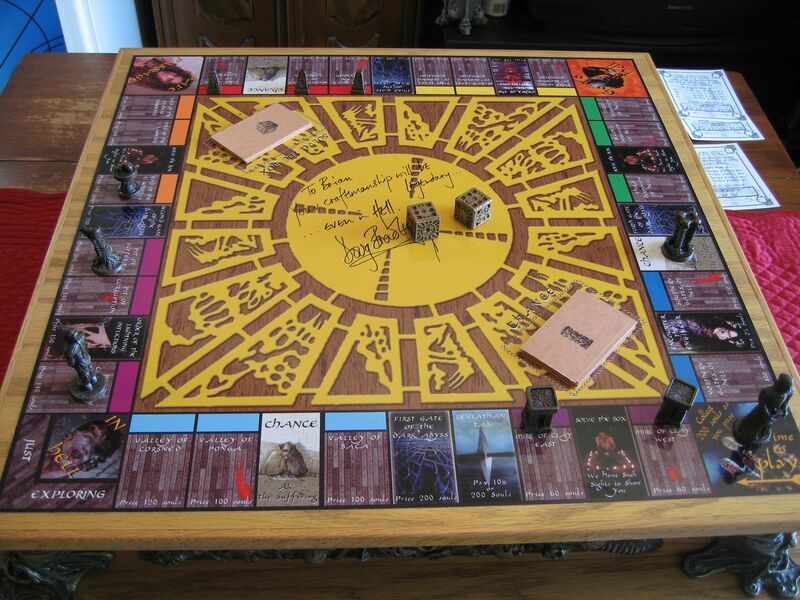 I'm looking forward to my next play of this, I must say, and seriously considering owning a copy myself. 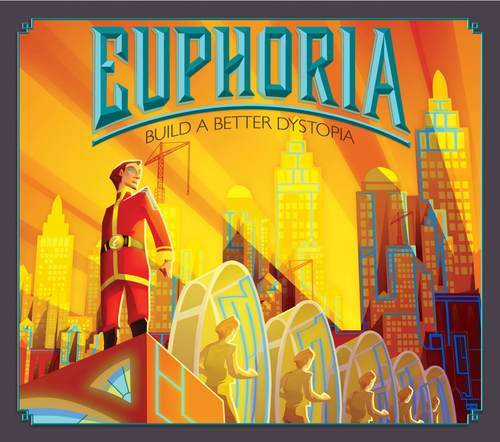 Highly recommended, especially if Agricola and Dominion float your boat. And you don't have to feed your family!!!! Action spaces and "campaign workers"
UPDATE: 2-player game is way too easy. Fun but devoid of tension. 4-player is excellent and illustrates the many ways to scoop points. But for length of play I think 3 players is just right. Enjoy this hilarious video paying tribute to how complicated board games can feel sometimes. "Go directly to hell, do not pass go, do not collect 200 souls..."
Clive Barker has always been one of my favourite authors, although I know his particular brand of gruesome ain't for everyone. He has quite the library of fiction and film and you can tell he loves his fans because he is always featuring their artwork on his Facebook page. 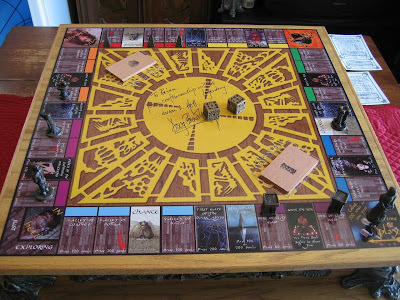 And some of it is pretty cool, like a recent post about this wicked Hellraiser Monopoly board made by fan Brian Sharp. If you've read The Hellbound Heart or seen Hellraiser, then check out the original post to see more of the awesome handmade Cenobite pieces. 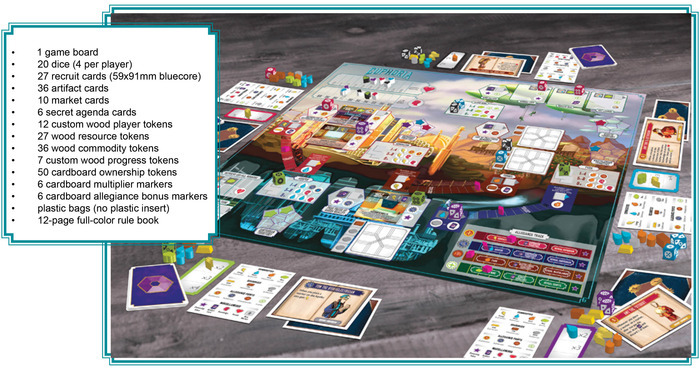 I'm starting to believe there is a bit of a renaissance occurring in board game circles, a rejection of the new and shiny and complex. The complexity of modern games has left a lot of us with a sour taste in our mouths. What happened to the simple, elegant brilliance of Modern Art or Ticket To Ride or even Power Grid? Or even short games like the excellent Coloretto or For Sale? Okay, maybe it's just me. But still, I gotta think people are looking for more simplicity when gamers keep mentioning Love Letter in every second post and article I read. If you haven't heard of Love Letter, then you probably don't read too many board game blogs. So why is a game that costs $7, plays in about 5 minutes, and uses 16 cards and a few red cubes suddenly the darling of the game world? Well, maybe that's just it. Simpilcity. 10 seconds of rules explanation which yields, I daresay, a great half hour of fun, albeit very light fun. 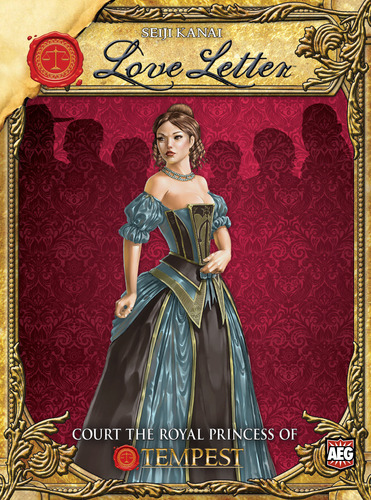 So how does Love Letter work and how can it play so well with only 16 cards? (The cubes are really extraneous and serve only as scoring markers.) The rules are dead simple. You hold one card and on your turn you pick up a second card. Then you have to play one of your cards face up and do what it says. That's pretty much it. The goal? Be the last player left in the round or be the player holding the highest card when the draw pile empties. It's overly simple but what makes the game interesting are the card powers. Cards are numbered 1-8 and the different values all have different actions. One lets you look at another player's card, some let you guess an opponent's card and eliminate that player if you're right, one makes you discard your other card of a certain type, and so on. Each option is simple but the interplay of the actions is what creates such an enjoyable little round. It's entirely possible to be eliminated on the first turn but when rounds can run under 2 minutes this doesn't really bother anyone. Shuffle 'em up, deal another one! Yes, Love Letter has a hefty dose of luck but I've never seen so much fun packed into such a short, simple package. Do yourself a favour and pick this lovely little filler up - anyone can learn it and anyone can play it and everyone will love it. And for 7 bucks, that's a pretty awesome deal.